By “picturing”, I am primarily referring to photography. The following entry is devoted to two subjects, though they are both about photography. Assuming, to begin with, that there is a natural desire to take photographs and videos of a historical reenactment, the desire to make such photographs is natural and that the photography is a good thing, the questions we investigate are valid. The first deals with the question of what the finished photographs should look like, whether they should be altered in one way or another. For many people, this means that you are recording military reenactments which boil down to battlefield reenactments. It should be noted that while I have taken battlefield photographs, it has been in civilian dress. To take photographs of the everyday life that is represented at the living-history exhibitions is more satisfying to me. While it is possible to have a camera in eras being recreated that had this technology—times since 1836—as long as the cameras look similar to the historic version. We will forgive those eras when the length of the exposures means that there were no photographs of the actual military actions unless they were incredibly blurred and ghostly, and this last almost up to the invention of motion pictures! Until then, it was all still photography where they attempted to get photos of the soldiers—usually staged and static—and the aftermath of the actual battle—showing posed living persons (such as the prisoners after Gettysburg), corpses (for example the scenes of a deceased sharp shooter in the Devil’s Den…which was apparently a posed shot itself), scenes of what had been a battlefield (such as the scene of Seminary Ridge) and non-battle shots of stationary scenes as meetings (such as Grant’s meeting with his staff at Bethesda Church, Maryland). Sepiaizing or otherwise making modern shots look as if they were period shots has an advantage for eras that actually had photography because it tries to emulate the photography that was actually done at the time. For eras before the invention of photography—as well as many eras after the invention when they did not have the means or technology for action photography—it becomes a matter of choice. How many scenes of a Saxon reenactment looks as if it might have been a shot of a Victorian era Viking reenactment? Has this shot been sepiaized but for no good reason and does not add to the verisimilitude of the shot? For that matter, the color of the photograph undergoes a number of questions. Do you make all the photographs all sepia? Do you make them as colorful as possible? Do you adjust the color balance so that it does reflects the colors that were available in artwork of the era? For that matter, when dealing with black-and-white prints, should the actual black and white balance be altered? These are all questions that the photographer must ask…and answer as well. There is no single answer. And photographers have to make their own decisions. For that matter, they must even decide whether they should even forsake the idea of photography and make all shots line or wash drawings? Third, and this is the most delicate and questionable, is to have cameras that hide—in “books” for example—that can be brought out for a quick photograph (not out of the enclosure of course) and then quickly returned to hiding. 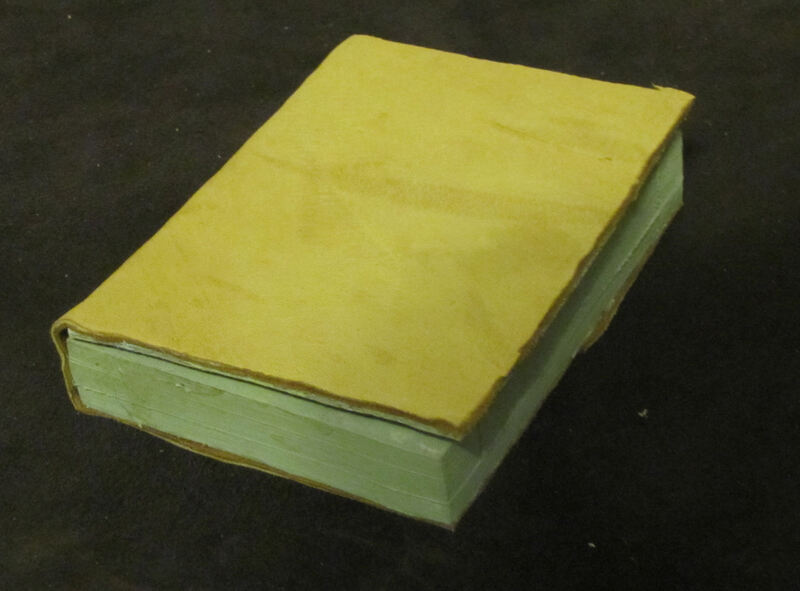 This latter is what I have resorted to, and I have created what looks like a leather-bound book. It has surprised many people, who see it sitting before me among other books (real books) that I have bound and never realized it was something more. Some folk have even noticed it being used and do not recognize what it is! The method I use for disguising the camera is not the only way that a dedicated reenactor can approach the subject. I first considered, for example, hiding the camera inside a runestone, but I decided against that because of a lack of needed mobility. Anyone who has any method that he uses that goes beyond the book are encouraged to share their methods with us all here. The more ways that reenactors know to disguise their cameras, is good. It helps to avoid a common way that people disrupt the atmosphere of a reenactment! This entry was posted on December 9, 2014 by folo1. It was filed under Uncategorized .